Probably the most difficult giveaway yet. The above oddity contains the letters of your anagram, the punctuation not specific to the answer. If you are the first person to reorganize them into what this freebie is, you win! 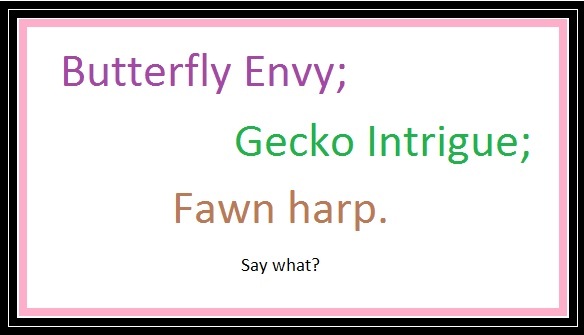 Butterfly Envy; Gecko Intrigue; Fawn harp. Alright, as promised, here is hint #1: Just like the game hangman, here are your word spaces. And, best part is, you already HAVE your letters. Just need to rearrange the above words into them. Good LUCK! _ _ _ _ _ _ by _ _ _ _ _ _ _ _! Please submit your answers in the below comment form. Good Luck!